1: Mishra's Factory becomes an Assembly Worker, a 2/2 artifact creature, until end of turn. Assembly Worker is still considered a land as well. 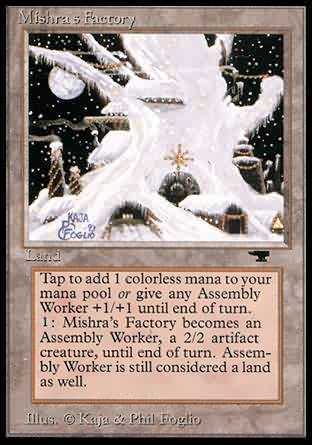 1: Until end of turn, Mishra's Factory becomes a 2/2 Assembly-Worker artifact creature. It's still a land. T Target Assembly-Worker creature gets +1/+1 until end of turn.